A guest post by Professor Sarah Tolmie. 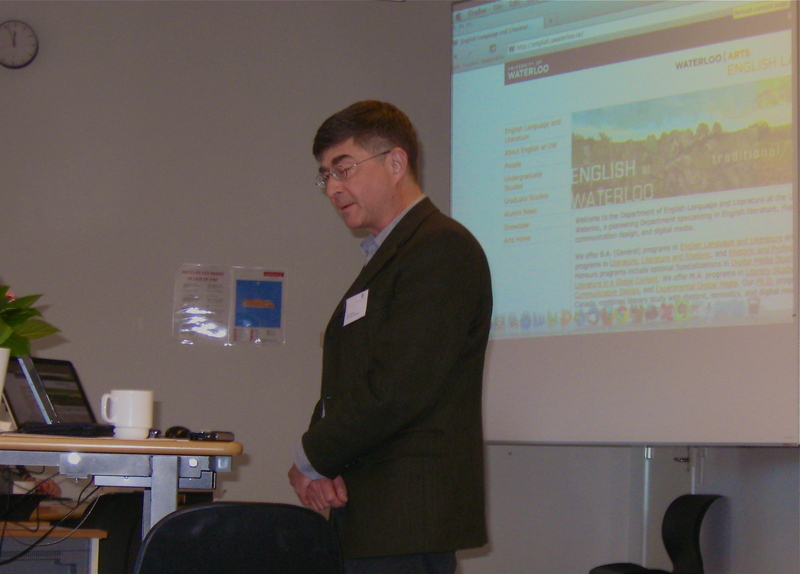 Back in October, just around Thanksgiving, I attended a conference at the University of Southern Denmark, in Kolding, on the Future of English Studies. Fraser Easton, as chair of English, had circulated a call for papers several weeks before, and very spontaneously I decided to go. A flurry of e-mail with the organizers, Jane Vinther and Gordon Slethaug (former chair of English here at uW and our main connection to the institution) followed, and then I found myself on a plane to Copenhagen (via Reykjavik and its shockingly expensive airport) and subsequently on a train down to Kolding, about an hour from the capital, along with my husband Scott Straker, a medievalist who teaches at Queen’s University. As it happens, we met Fraser at Pearson airport, at which time we all figured out that we were going to the same conference; we then managed to lose each other shortly after arriving in Copenhagen and didn’t catch up until the following day. Academics are fairly hopeless at this sort of thing. However, after checking in at the lovely old hotel, the Saxildhus, mid 19th century and a bit down at heel, and eating a fabulous meal at a restaurant in the oldest building in town, a 16th-century merchants’ hall, we felt we were in shape for the conference, despite imminent jet lag. After a 10-minute walk through the commercial part of Kolding the next morning, we arrived at the University of Southern Denmark campus (one of three campuses in the region that amalgamated only a few years ago, the others being at Aarhus and Odense). Scott’s paper, on cross-border anxieties in the 15th-century Anglo-Scots text The Kingis Quair (proving that some problems of globalization are hardly new), was in the first session. Mine, on the Salvation Suit project — a virtual reality translation of the 14th-century visionary poem Piers Plowman, a “wearable poem” as I am calling it — was the following afternoon. Fraser’s, on “The English Department of the Future” (which means us here at uW, apparently) was shortly before mine. We all got our words out, and they were all cordially received. There were about thirty international attendees, plus graduate students from the university. Papers were various, many tending towards language learning and pedagogy, as you might expect from the conference theme. It was interesting to observe that a main focus of the conference — namely, English studies — has a particular institutional inflection in Denmark, one that is currently under scrutiny, if not attack, by a populist and pragmatic government. There was some fear that current departments of English studies, which teach both literature and language, would be dismantled in face of increasing pressure for market-driven, competence-based language learning — and that literature teaching would be the automatic loser. Thus, a major effort at disciplinary re-branding and reclamation of humanist identity was underway, to which the conference was contributing. Overall, probably the most interesting aspect of the conference for me was witnessing this difference in institutional status, in a culture that is unofficially, at least, bilingual, Danish and English. Most Danes, both in the university context and outside of it, speak astonishingly good English. The present educational system is clearly serving this function amply: the question is, seemingly, what is value-added by having students read literary texts? Your admin speaking now: Good question, Sarah. Any responses to “what is value-added by having students read literary texts? Also, here are some photos from Sarah’s Danish experience. A Guest Post by Professor Fraser Easton. The conference held a few surprises for me. First of all, it was a conference on English Studies held in a non-English speaking country (well, not really: all Danes seem to be able to speak excellent English; still, the first language is Danish, and most media is in Danish, with some Swedish, Norwegian or German language channels). This meant that English Studies was viewed in an international framework, and not only in terms of the global spread of English Literature. Issues in linguistics, ESL, and English as a Lingua Franca (for which there is even a journal) were among the hotter topics. So all in all it was a nice decentering of some of the normative assumptions one makes about the focus of the study of English in an English-speaking context—that, for example, the study of national literatures, particularly our own, should be central. The next pleasant surprise was a talk by Dr. Janette Ryan on “Internationalising teaching and learning: Making room for other knowledge, language and academic values.” The talk spoke directly to the challenges international students face when English-speaking institutions are happy to charge them higher fees, and then leave them to sort out all sorts of hidden assumptions about the classroom, curriculum, and even the nature of English competency (what Dr. Ryan calls “A ‘native speaker norm’ [that] exercises tacit power in pedagogy and assessment”). It was particularly fascinating to learn that Dr. Ryan had taken a university degree in China, is fluent in Mandarin, and can speak convincingly about the nature of Chinese and Western educational assumptions. Another wonderful surprise—although it shouldn’t have been—was the talk given by my colleague Sarah Tolmie on “Poem/Design: Translating Piers Plowman into Virtual Reality.” I have known about Sarah’s Virtual Reality, Critical Media Lab-inspired project for some time, but this was the first time I had heard her speak about it. The effect on the audience was electric: to take Langland’s poem, digitize it into a virtual realm, and then to use that as a way to test the theories of embodiment that are in part the subject of this dream vision was intellectually provocative and exciting. That Sarah was able to show the VR in action was all the more “immersive” for her academic audience. My talk was titled “The English Department of the Future,” and there was a really bad photo taken of me as I was giving it. No, I didn’t talk with my eyes closed: I was just looking down when someone snapped the shot! On a personal note, I got to stay in an eighteenth-century warehouse in Copenhagen that is now a hotel on my way back from Kolding. On the way to Kolding I got to speak with a PR rep for LEGO, which is based a few miles away from Kolding in Billund, and ask lots of questions on behalf of my eight-year-old son. Your blog admin speaking now: Come back tomorrow to read a post by Professor Sarah Tolmie about her experience of the same conference. Such fun this academic tourism thing.